A bank draft is a check that is drawn on a bank’s funds and guaranteed by the bank that issues it. Similar to a cashier’s check, a bank draft is safer than a personal check when accepting large payments. To get a banker’s draft, a bank customer must have funds (or cash) available. The bank will freeze the amount needed or move those funds into the bank’s accounts until the payment is completed. The term bank draft is used for other situations, and use varies from country to country. For example, electronic bill payments that move funds directly from a bank account to a service provider (such as an electric utility provider or an online merchant) are also called drafts. Scroll down for a discussion of that type of draft. A traditional bank draft is a useful tool when safety is paramount. Large amounts: For high-dollar transactions, the consequences of a returned or bounced check are significant. It’s risky to send expensive goods or complete a deal when there’s any uncertainty about getting paid. A bank draft is a guaranteed form of payment that makes the payment much more likely to be successful and legitimate. Available funds: Standard checks can take several business days to move through the banking system. Receiving a check doesn’t mean you’ll actually receive funds or that you can withdraw the funds immediately. Bank drafts are typically available in the recipient’s account within one business day, and it’s unlikely that the bank will reverse the deposit a few days or weeks later. As a result, bank drafts are popular for things like international trade or purchasing a home. To understand the features of a bank draft, it’s helpful to compare and contrast with personal and business checks. When a person or business writes a check, they don’t necessarily need the money available in their account—they can write a check for any amount they want, and the recipient cannot be sure if the check will bounce or not. Of course, there are consequences for passing bad checks, but checks bounce all the time. Sometimes it’s an honest mistake, and nobody’s trying to defraud anybody—it’s easy to forget about other transactions that drain an account. With a bank draft, the funds are moved from the payor’s account into the bank’s accounts immediately when the bank issues the draft. In other words, a person or organization paying with a bank draft can’t even get a bank draft unless they have the funds required. There’s no way for them to spend that money before you deposit the bank draft—because the bank already took the money out of their account. Instead of relying on everybody who writes a check, you can depend on the bank to back up the payment. And banks presumably have significant assets and strict procedures in place to make good on the check. If the bank goes out of business, you won’t get paid, but that risk is relatively small. Are Bank Draft Payments Safe? If somebody pays you with a bank draft, you can’t always assume you’ll get the money. 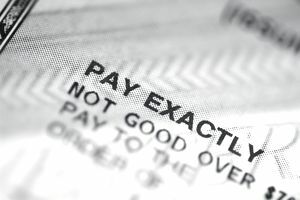 Scams regularly use fake cashier’s checks to swindle victims. You may believe you’re getting paid with cleared funds, but you should always check with your bank and verify that the check is legitimate before you spend the money or sell something valuable. You can even go a step further and verify funds with the issuing bank before handing over merchandise or depositing a bank draft. Be especially wary of anybody who overpays and asks you to send money back—that’s a major red flag suggesting you’re dealing with a thief. For more details and examples, see How Cashier’s Check Fraud Works. Find out How Long to Wait After Depositing a Check before you spend the money. To deposit or cash a bank draft, treat it like any other check. Take it to your bank or credit union and endorse the back of the document. Your bank will credit the funds to your account more quickly if you make your deposit with a bank employee, as opposed to using an ATM or mobile device to deposit. Plus, you might be able to get more (or all) of the amount in cash immediately. To get a bank draft, ask your bank or credit union for one. In the United States you'll typically get a "cashier's check," but other countries use the term "bank draft". You can walk into a branch and get one from a teller, and you might be able to request drafts online. Your chances are best if you go through a bank that you currently have an account with: Most institutions only provide this service to customers. Out and about? If you're away from home or you don't have a bank account, you can always try walking into another bank’s branch and asking. You'll need to pay the full amount of the check (plus fees) with cash or a debit card cash advance. Alternatively, you can try making your payment with a money order, which should be available at numerous grocery and convenience stores. However, money orders might not be an acceptable form of payment, so ask the recipient first. Credit union members: If you use a credit union, you may be able to get an official check from another credit union’s branch (while accessing your account at your home credit union). Thousands of credit union locations participate in shared branching. Be sure to bring ID with you, and expect to pay a modest fee (often around ten dollars). The term bank draft can also refer to automatic electronic payments. These payments allow businesses and service providers to transfer funds directly out of customer checking accounts. Instead of writing a check or paying with debit and credit cards, customers provide bank account information (account and routing numbers, specifically) to the business to set up draft payments. These transfers typically happen through the Automated Clearing House (ACH) network, and they make it convenient for customers to make recurring (or one-time) payments. Customers benefit because they don’t have to write checks or type in credit card information every month. Businesses win because they don’t need to deposit checks, wait for the funds to clear, or pay processing fees for card payments. Businesses can start offering payment by bank draft by setting up a merchant account or partnering with a payment processor that accepts ACH payments. These payments are typically less expensive for merchants than credit card payments (as little as a few cents each), and less prone to chargebacks.